Getting ready for a 100m semi-final, at 19:05. It is normally a huge event in the athletics calendar, but because it’s Usain Bolts last race and you’ve made that public, it becomes a monumental occasion. The emotions must be huge for Usain Bolt, they may come out later especially when he’s crossed the line or is on the podium. We are so used to watching Usain destroy the best in the field, but following last nights performance, and his stumbling start, no one is sure, if his body can deliver again. Fittingly, it’s in Stratford, London. The Final will follow later this evening following the semi final heats. Win, lose or draw, the world of athletics will struggle without him, and the rest of us, will miss the greatest Olympian of all time. 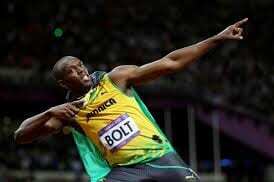 100m final at 21:45 – Bolt bidding for 12th world gold and fourth in 100m. We eagerly wait for the showman, hoping for the spectacular. Men's 100m tonight. Bolt will only be challenged IF the challengers produce their best here tonight. He doesn't have to run his best.